It's about as close as you'll get to the Kiwi classic without the blob of ice cream on your chin. 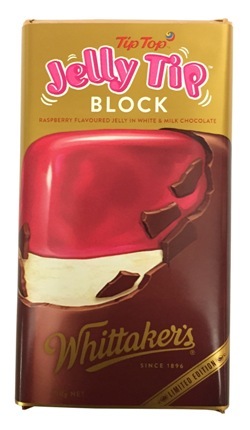 This limited edition Whittaker's Jelly Tip Block combines divine vanilla white chocolate, sweet raspberry flavoured jelly filling and Whittaker's smooth Creamy Milk chocolate for a complete Tip Top Jelly Tip hit. With the tip on the inside, the bottom on the top and the outside on the back, it's every bit the ice cream icon, reinvented for you in chocolate. White Chocolate (44%) (Sugar, Milk Powder, Cocoa Butter, Emulsifier (Soy Lecithin), Vanilla Flavour), Jelly Tip Filling (30%) (, Glucose, Sugar, Water, Invert Syrup, Acidity Regulator (Citric Acid), Natural Raspberry Flavour, Gelling Agent (Pectin), Thickener (Locust Bean Gum), Natural Colour (E163)), Milk Chocolate (26%) (Sugar, Cocoa Solids, Milk Powder, Emulsifier (Soy Lecithin), Vanilla Flavour).